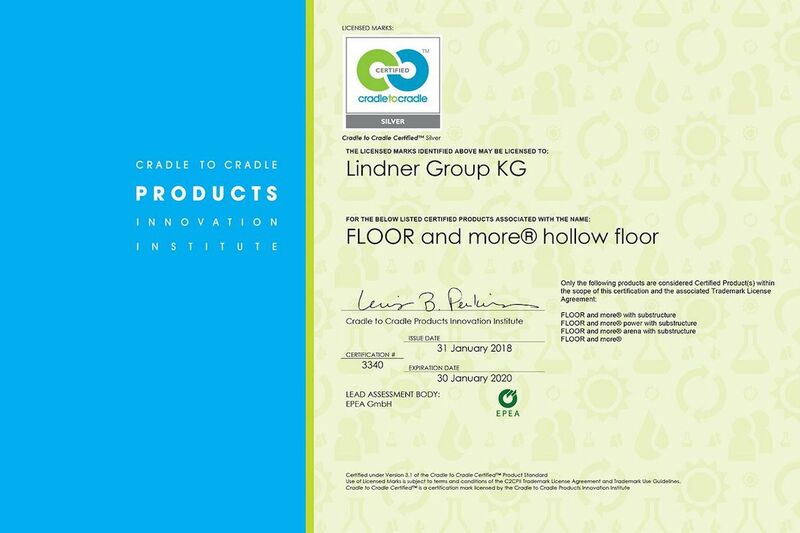 With the FLOOR and more® hollow floor system, the Lindner Group has certified another flooring system successfully according to the Cradle to Cradle® evaluation system. In addition, an Environmental Product Declaration (EPD) has been prepared in accordance with ISO 14025 and EN 15804. 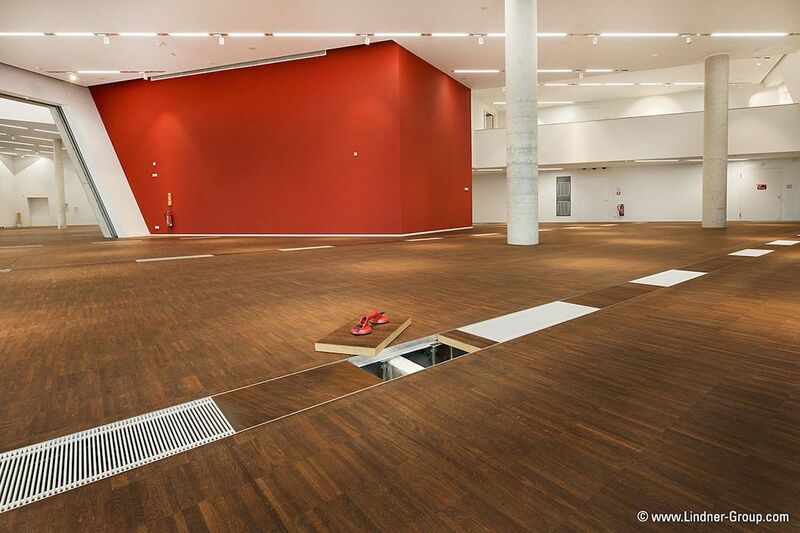 Besides the NORTEC raised flooring system, FLOOR and more® hollow floors are now also available for more sustainable and healthier interior fit-out. In late 2016, NORTEC was already successfully classified as Cradle to Cradle® certifiedTM Standard Silver and tested again at the end of 2017 for its eco-effectiveness by EPEA International Environmental Research GmbH. 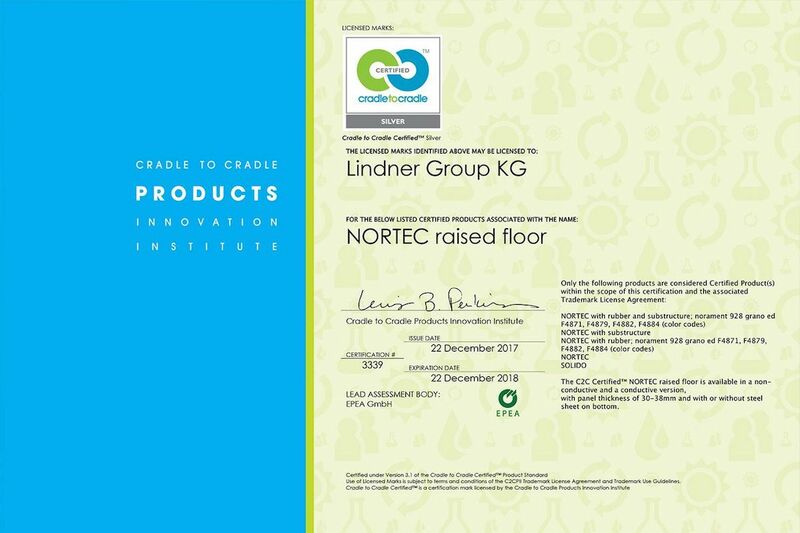 Thanks to continuous product optimization in cooperation with Lindner’s own green building department, NORTEC has been able to improve in the various evaluation factors partly on gold status and even on platinum status in the “Water Stewardship” rating. One of the first steps for a successful certification is the identification and evaluation of the materials and ingredients of the products. This status is the starting point for further internal checks and, if necessary, the revision of the product. This procedure is explained in more detail in a separate “Material Health” certificate. The product range NORTEC has been awarded the Silver Material Health Certificate. The flooring systems FLOOR and more® and NORTEC fulfill the high demands on individual design and function as well as the desire for healthier materials in interior design. The basis for this are the almost emission-free, biologically recommended fibre-reinforced gypsum panels from our own, LCA-balanced production facility, which are produced in a closed cycle. In the sense of “raw material recycling” or “material reutilization”, Lindner offers a unique redemption guarantee. Thanks to its own recycling system, including its own calcination plant, one of the most modern processing plants worldwide, the floor panels can be returned directly to the manufacturer´s production cycle after use. As disposal costs will be omitted at the end of the useful life and will be minimized to pure transport costs, this system contributes significantly to saving costs. With the system NORTEC, there is also the option of refurbishing the panels in order to install it as a new system in an existing building or in a new building. Lindner offers another economically attractive option: in form of leasing, the flooring system will be provided for the period of use and subsequently either taken over, returned to the manufacturer’s cycle or prepared for resale. This is a financing model that helps to save taxes and is especially interesting for liquidity-driven investors.